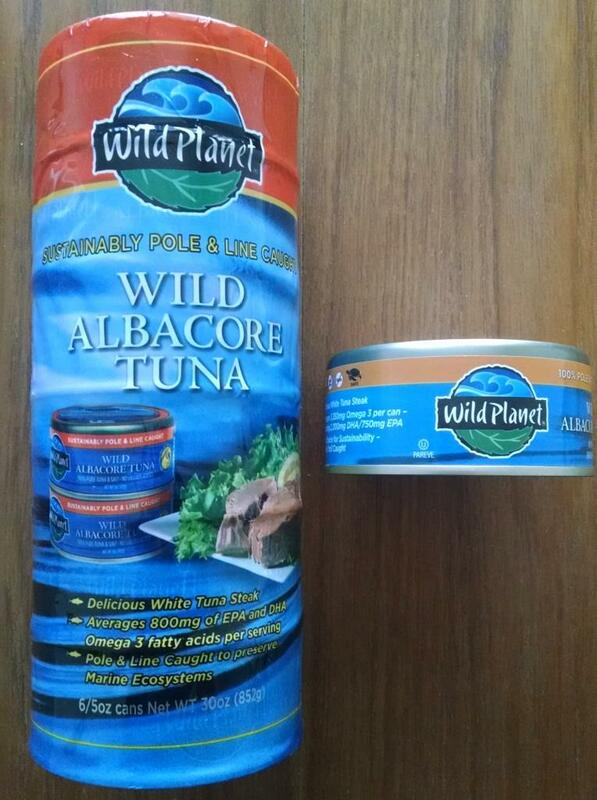 Wild Planet Gluten-Free Tuna Rocks – Because Not All Tuna Is Gluten-Free!! Yes, you heard that correctly. I bet you, like I used to, thought tuna was safe from gluten because it’s fish. Well, think again. Most of those cans say “packed in water” – right? Well, guess what? It’s not really water. It’s vegetable broth or chicken broth – and guess what? That’s got gluten in it. I’ve only come across three types of tuna available in mainstream grocery stores which are gluten-free: Bumble Bee Albacore (gold and black label), certain Starkist products, and Wild Planet. I have to say, there’s no contest in taste and consistency. Wild Planet wins that by a long shot. But that’s not the only reason Wild Planet wins my business. It is 100% pure tuna and sea salt – nothing else. AND no BPA is used in the can lining. AND it’s, of course, non GMO. AND – they are pole and troll caught. That means they are dolphin and sea turtle safe! Even better, though – Wild Planet catches smaller tuna that accumulate less mercury than the bigger fish. When you open a can of Wild Planet, you will see an actual chunk of fish. It’s not a bunch of fish pressed together. You need a fork to get it out. And maybe a knife! This is the real deal, people! Since no liquid is added, you don’t have to drain it like you do with other brands. AND, it’s a pop top! No pesky can opener required. Are you convinced yet? Come on! Let me tell you, every person I have coerced – I mean – convinced to buy a can has never gone back to the other brands. Yes, it’s really THAT good. So you can rest assured, it’s all gluten-free. Great product, great people, and gluten-free. GO GET SOME NOW! And don’t ruin the fish by putting a lot of stuff in your tuna salad. A little bit of mayo mixed with a little bit of sour cream (sour cream is way lower in calories and fat than mayo, and has a lighter flavor) and some chopped celery and you will have the best tasting tuna sandwich EVER. I also like to eat it like dip on tortilla and potato chips. SO good! If you want to try Wild Planet Wild Albacore Tuna but you’re a little iffy about the price, check your neighborhood Costco. They offer a pack of six at a great price. Recently, a number of friends have been diagnosed with gluten-intolerance – so I wanted to put something together to help them shop for gluten-free food. Last week’s video takes place at a WalMart store, and this week, we take on Costco. Of course, you can apply the lessons to any store. I will continue the series with additional episodes in Trader Joe’s, and even Target to help folks shop gluten-free with confidence. Please keep in mind, I’m a writer, not a videographer, so sometimes I forget I’m filming and the picture goes off the rails a bit. And the splicing isn’t perfect. In any case, I hope this video is helpful.